This phone call comes at least every other year: a concerned parent, friend or cousin, calls freaked out that someone they know has swallowed a lot of Datura seeds. Somewhere in their story there is usually a copy of a sleazy book on legal herbal highs or a confused white person gullible enough to seek guidance from the writings of profiteering frauds like Carlos Castenada. These callers would like to keep this child or young adult out of the hospital. However, the adolescent's (and it usually is an adolescent who ingests datura seeds) caretaker, if not the caller, can't cope with the youth's wild, often violent agitation, and all engulfing delirious hallucinations. The youth is often flushed red, with dry throat, mouth and eyes, heart beating irregularly. This can last for days. They do not want the poisoning victim hospitalized in restraints. They would like to avoid more mind-altering drugs that the hospital will give. Sometimes they express concern that more mind-altering drugs will make the child loose whatever shreds of personality coherence that he or she has left. Some are concerned that the youth may loose whatever spiritual insight may have been gained with a "special power plant." They want advice on how to help their loved one. The antidote of choice is physostigmine salicylate, trade name Antilrium. It works fast. Onset of action, when given parenternally is 3-8 minutes. It needs to be used carefully, given slowly, and should be used cautiously with those with asthma. Physostigmine quickly lessens the mental confusion, hallucinations, and physical effects of datura poisoning. Physostigmine has fewer side effects and complications than either benzodiazepines or phenothiazines. Victims of datura poisoning treated with physostigmine have shorter hospital stays than those treated with benzodiazepines or phenothiazines. Request physostigmine. If the doctors refuse to give physostigmine in a bad poisoning case, ask them to explain why they will not give it. Have them put their response in writing. Benzodiazepines (Valium like drugs) are usually a poor second choice. They don't work nearly as well as physostigmine. The benzodiazepine dosages are very high, and usually blur the clients' consciousness further, leaving him or her sedated for a long time. 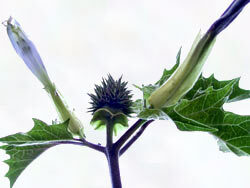 The benzodiazepines offer little or no relief for the somatic disturbances caused by datura seeds. They will not necessarily lessen mental anguish, but will slow down and sedate the poisoning victim, rendering him or her safer from self-harm. Phenothiazine tranquilizers should never be used for datura poisoning. Unfortunately, they are often used- they are the uneducated doctors' first choice of treatment. Haloperidol (Trade name Haldol) and chlorpromazine (trade name Thorazine) are sedative antipsychotics - used to sedate agitated people. They sedate the client, but also exacerbate mental distress, and often aggravate physical symptoms. They both strongly blur the mind, and will indeed make the client loose any understanding of what has happened. They often aggravate the datura seed intoxication, adding into the datura seeds' anticholinergic poisoning through their own anticholinergic action. Worse agitation, drier mouth and more blurred vision are the result. Unfortunately, these two drugs are often the first chosen in an emergency room for datura intoxication. Phenothiazine tranquilizers are little more than chemical straight jackets. Ask for physostigmine. There are broader issues here. Why are people, completely outside of appropriate cultural context, ingesting datura seeds for fun or enlightenment? It never provides the former, nor the latter for those without appropriate guidance from within the few Native American cultures that still use datura seeds ceremonially. (If some one offering to let you pay them for a workshop on multi-culti shamanism offers to guide you through a datura seed 'vision quest' simply ask them how to say "datura seed" or "huckster" in Tungus as you quickly leave.) Why are mainstream herbalists often unable to offer care and education regarding datura poisoning? Mainstream herbalists could and should be more vocal in our denouncement of pseudo-Native American sham artists like Carlos Castenada and romantic entheogen enthusiasts that popularize datura ingestion. They confuse the narrow and injudicious use of psychoactive plants for the richness of traditional medicine, with its cultural and geographic basis, religious roots, and depth of biological understanding. Nor do they understand the role of traditional medicine in First Nation people's survival. The common romantic enthusiasm amongst nonnative people for all things Indian, especially spirituality, is usually indicative not only of personal pain and confusion, but also of a personal and cultural lack of historicity, as well as an unexamined sense of entitlement that rests on white supremacist and colonial privilege. This romantic fascination, besides being a waste of time, is harmful to both those who hold it and those objectified by it. Spiritual self-importance, a common problem in the mainstream herbal scene in the United States, gets in the way of cultural humility, cultural competence and the delivery of competent healthcare. We are no different from the dominant culture, because, good intentions aside, we are the dominant culture. Lack of critical awareness and self-critique on these issues does lead to pain and suffering for all parties involved.